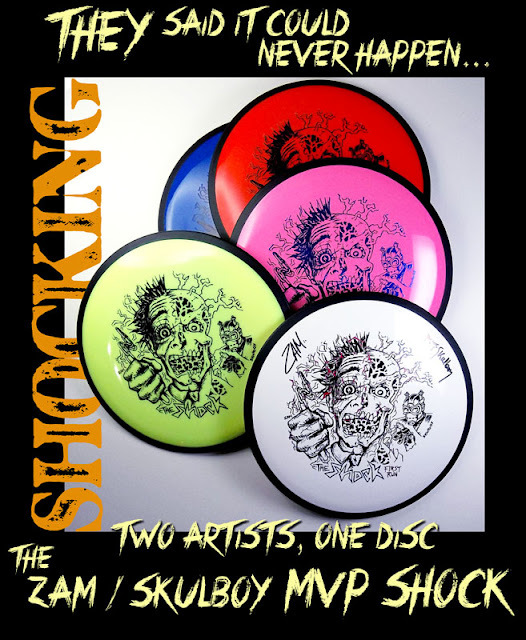 Disc Golf artists, Zam and Skulboy, collaborated on this electrifying custom stamp for MVP's latest Fairway Driver, SHOCK. You can read how it all happened in this previous post. They've been stamped by Disc Nation and are now available in the Skulboy Disc Store. While supplies last, I have the collectable 2-color, double stamped 1st run MVP Shock numbered and signed by both artists. Limited to only 30 discs, these will go quickly.